Flange pillows are great fun and are used alot by many of our favourite designers. So what is a flange pillow? Its a pillow that has a border of flat fabric that goes around the outer edge of the pillow. This border is not sewn on; it is an effect created by sewing and stuffing the actual pillow a few inches away from the edge of the material. 1. Your stitched piece. 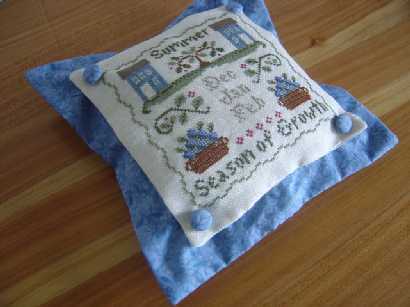 (My stitched piece was 5" by 5" square). 2. Some plain backing fabric (calico fabric is good for this). 3. Sewing thread and fabric to match your design. 4. Stuffing for the cushion. 6. Pins, sewing scissors, a needle, and your sewing machine. The class is going to be the weekend of the 21st & 22nd July so I hope you can join me then. In the meantime, happy stitching and feel free to leave me any comments if you have any questions.